Do our students help write the script for learning or do they sit in the audience? This is a question we regularly ask ourselves, and although we definitely want to say the former, the true answer is found in how we use our time. As we count down our last days of first quarter, we are at the perfect time of year to take a close look at our daily schedule, to see if the value we place on student-driven learning is truly reflected in our day. Today we’d like to share one of our favorite projects that fosters student choice and empowerment,student created book trailers! 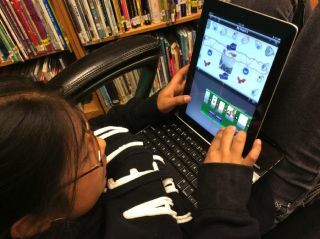 They are multi-media projects that encourage students to take on the roles of writers, actors and directors of learning. A Spanish language book trailer created by a third grader. Together teachers and students define which standards will be addressed. Once students demonstrate they clearly understand the purpose, the creative direction of the project is primarily up to them. For example, students might choose the theme, tone, script, etc. Next enters joy and engagement as they compose music, act, illustrate, read and write about what’s most compelling to them. In other words, students decide how they will prove they have learned what they set out to. In Writing Workshop 2.0, in addition to publishing their narratives digitally, students might print them as well. Then QR codes leading to student-created book trailers advertising their books are placed on the copies. Other QR codes featuring a student read audio book version are placed on the print copy as well. Joy is found not only in the creation; it expands further as they get to share their writing and book trailers with the whole school. This is incredibly powerful for them since it creates a sense of authentic purpose for writing. By creating the trailers and books, students have more access to texts that reflect experiences of other students “like them”. This is a particularly powerful opportunity for ELL students to tell their stories and the stories of their families, especially given mainstream portrayals of immigrant communities. Students write and publish narratives. The book trailer concept is introduced, and students are given a descriptive rubric. Students use the rubrics to evaluate professional or other student created book the trailers before creating their own so that they know exactly what the CCSS learning goals are and what is expected from them. Students then use iMovie to create book trailers about their stories. Students use the rubric to make sure their trailer includes all of the key components. After that, students use Voice Record Pro to record themselves reading their narratives. They then convert their voice recordings into QR codes so that other students can hear the stories read aloud. Place the books with the QR codes on them in the school library so that students throughout the school can read the print versions and scan the QR codes to access the book trailers, as well as audio versions of the books. Read more by educators Ashley Coblentz and Jackie Moreno at widaatwcer.blogspot.com.